Choice announces the third in a series of white papers designed to provide actionable intelligence around topics of importance to the academic library community. 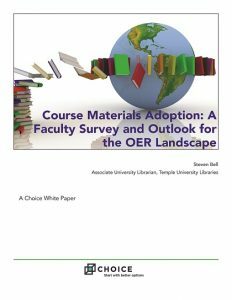 This third paper, “Course Materials Adoption: A Faculty Survey and Outlook for the OER Landscape,” is an analysis of the responses to a survey of US faculty conducted by Choice in the spring of this year. It offers a glimpse into the decision-making process used when selecting instructional materials for higher education courses, with specific attention devoted to the factors critical to the adoption of open educational materials (OER). Written by Steven Bell, Associate University Librarian at Temple University, the white paper provides an overview of the development and growth of OER in American higher education and presents an empirical look at how faculty evaluate and ultimately decide to choose OER for instructional material. It explores the process used to source appropriate materials, what difficulties this may entail, and whether these obstacles may be preventing some from adopting OER. The conclusions derived from Bell’s analysis of the survey will help OER advocates and educators understand the factors that contribute to instructor decisions when choosing their educational materials. 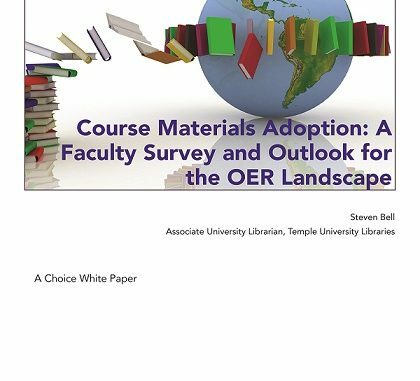 “Course Materials Adoption: A Faculty Survey and Outlook for the OER Landscape” has been published under a CC BY-NC 4.0 license and is available on the Choice 360 website.